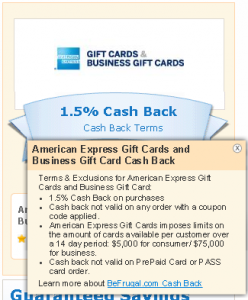 Either Cashbackholic.com or Cashbackmonitor.com hasn’t update the change, but BeFrugal also resumed the offer. Unlike the term at Topcashback, BeFrugal clearly says “Cash back not valid on any order with a coupon code applied.” So, you’d better not use any coupon or promo codes even if you purchase through Topcashback. I checked other portals with some hopes of a better cash back rate. Here are the results. These are all I could find for now. None of portals has coupon codes. Except for BeFrugal, the terms about coupon codes are vague. However, as long as BeFrugal says “no cash back if you use coupons,” I won’t use coupons. BeFrugal is my faviorite, and I trust the most.